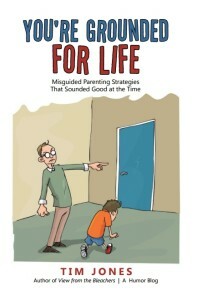 This humor book is a collection of hilarious essays on parenting in the era of Facebook and texting. If you’re a parent – or just thinking about making arguably the biggest mistake of your life by starting a family – then YOU’RE GROUNDED FOR LIFE may make you a better parent. Probably not. In fact, I’m laying 10-to-1 odds it won’t. But you never know. Whether you’re the parent of a toddler, a middle schooler or a college sophomore, you’ll find innovative parenting strategies the author has tried – all with hilariously disastrous results. If you’re looking for a humor book that looks at the funny side of trying to parent children intent on driving you insane, you’ve found it. As the father of high-spirited, rambunctious daughters, Tim Jones, author of the popular humor blog www.ViewFromTheBleachers.net, playfully shares pearls of parenting wisdom honed from futilely trying to understand the mysterious minds of kids. If you happen to have figured it out, could you give him a call? He’d really appreciate it.